From TV broadcaster Lou Dobbs and award-winning author James O. 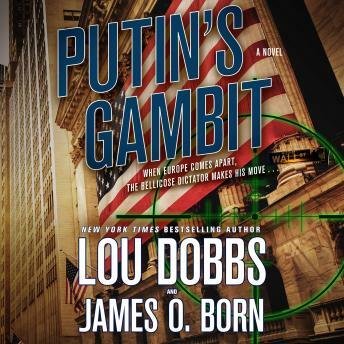 Born comes Putin's Gambit, an international financial thriller about a KGB plot to use a series of terrorist attacks as cover for a Russian military incursion into Estonia. Adjusting to civilian life has not been easy for former Marine Derek Walsh. As he navigates a brutal job on Wall Street and a challenging romance, he wonders if he could be doing more with his life. When an inexplicable $200 million dollar money transfer is made on his computer, he is thrust into the world of international terror, and the global economy is knocked off its hinges. On the other side of the Atlantic, a dangerous alliance has formed. Radical Islamists and Russian extremists have set the wheels in motion for Russia to assert its power in Europe. The US President has proven to be weak on foreign policy, the military is stretched too thin, and Vladimir Putin judges this to be the time for Russia to regain its Soviet Empire. Troops mass on the Estonian border, waiting for the order to move. The FBI believes Walsh was involved in the money transfer, and a group of Russians are intent on killing him. As New Yorkers are outraged upon learning of the illegal money transfer, and the world economy crashes after a series of terrorist attacks, Walsh and his Marine buddies are the only ones that can keep the world from spinning off its axis.